The stories of the Maratha saints have great moral value in that they give us pictures of God-fearing, righteous men, who in their lives sought to honour God, and to live for the good of their fellowmen. Bhanudas was the great grandfather of the great and noble saint, Eknath. Bhanudas( 1448-1513) from his a bhangs appears to be firstly, as an intense devotee of God, as represented to him in Virtual of Pandharpur in Maharashtra ; secondly, a emphasizing the moral character of God, he speaks of God’s impartiality, a saviour, Father and mother. Thirdly, in philosophy Bhanudas appears as a Vedanta’s; Fourthly, Bhanudas’s moral point of view. Necessity of a clean life. The book contains text in Marathi and an English translation. In the present translation from the Mahipati’s Bhaktivijaya, the translator has endeavored to be as literal as possible, consistent with the usage of the English language. I have long felt that the stories of the Maratha saints, which tradition has handed down, were a valuable moral asset, not only to the people of Mahãrãshtra, the home of those saints, but to all India. At present these stories are not easily available, for the reason that the Marathi language and literature are hardly known outside of Mahãrashtra. Even in Mahãrãshtra little prominence is given to the interesting and suggestive lives of those Maratha saints who by their godly and righteous lives have been a blessing to Mahãrashtra. I am not unmindful of the efforts made by Mr. L. R. Pangarkar, Mr. D. B. Sahasrabuddhe, and others to popularize the lives of the Maratha saints, but their writings have all been in the Marathi language, and, being untranslated, are not available for those who do not know that language. To make these stories of the Maratha saints available to a large circle, both in India and outside, an English. Translation is obviously a necessity. And as I feel that these stories have a moral value, and that they can be used to impress vital truths, the translation of them into the English language has been for me a labour which I have felt was worth while, and has been a about of love. Those who have not dipped into Marathi literature are naturally unaware of the original sources of the stories of the saints which are current in Mahãrashtra. I have therefore trade it my task to translate the original sources, from which all consciously or unconsciously draw, when they pass these stories at to others, either orally, or in written form. It is to Mahipati, who was born, lived, and died at Tãhãrãbad, in the Rãhuri taluka of the Ahmednagar District, that the chief glory belongs for collecting from manuscripts, and perhaps somewhat from oral tradition, the stories of the old saints, and recording theni in his own graphic style in his Bhaktavijaya, Bhaktalilãmrita, Santavijaya, and Santalilamrita. Some of the original sources from which he obtained his information are still extant, but for the most part we are dependent on Mahipati alone for any extended knowledge of those saints. Were it not for him, the lives of even such saints as Eknãth and Tukãrãm would be unknown except in a very meager way. All honour therefore to Mahipati, to whom Mahãrãshtra and the world owes a heavy debt of gratitude. Aside from Mahipati there are lesser lights that have recorded the traditional stories of some of the saints. While some are older than Mahipati, some are almost plagiarists from Mahipati, and some have evidently another and independent source. Altogether there is a considerable body of literature which can be considered original sources. They are the oldest we possess, and it is to such that I have turned for the English translations which I have made. In connection with these original sources, it should be observed that if in modem books, or on the lips of men, there are stories of these saints that differ in detail from those of the original sources, they are undoubtedly due to misquotations. The possibility of an independent source for these deviations may be conceded, but it is so improbable that very strong evidence would be needed to establish the fact of such an independent source. We all know that Indians are good story tellers. Some are professional story tells. Deviations from the original sources may therefore be only from the love of embellishment or from the slip of memory, but if their history be tract the seeker will without doubt be led to the original sources extant in manuscript or printed form. From the above it becomes evident why I have confined myself to the stories of the Maratha saints, as forted in the oldest sources or in the nearest removed from them, for the basis of my translations. They are nearest to the times in which those saints lived, and the traditions recorded in these oldest accounts are as near to the truth of their lives as we can at present arrive. No eye witness accounts of the lives of those saints exist, except that in some of their works these saints have left us slight references to their own lives, their ancestry, and their religious teachers. In the case of Tukãrãm, his abhañgs furnish much information regarding the chief events of his life, corroborating some at least of the traditions recorded by Mahipati. Another unique exception is the autobiography of Bahinabãi, in which not only is her early life described, but several important references are made to her actual meeting with Jairam Swami, a disciple of Rãmdãs, and with Tukãrãm at Deaf, and others. But these eye witness accounts are very meager, and the traditional accounts, written in most cases centuries after those saints really lived, are all we have to acquaint us with the lives of those godly men. The dates generally assigned to the births and deaths of the Marãhã saints are very uncertain. No one has yet undertaken a thorough and scientific study of the question. Some of the most universally accepted dates stand on very insecure foundations. Generally the easy method of 101- lowing tradition has been pursued. As the subject now stands, one does not know what to accept as historic fats regarding their births and deaths, and what as mere guesses, however wise some of them may be. It is much to be. Desired that some competent scholar would undertake this problem, and in the place of the present confusion, present all the available facts, making it possible to discriminate between solid facts and wise guesses. As I have not attempted to do what must fall to the lot of some more competent scholar, I feel that it will be less confusing if I accept as the probable dates of the Maraha poet-saints, those assigned them by such scholars of Marãhi literature as Mr. V. L. Bhave, L. R. Pangarkar and others. For the purpose of these translations the subject of dates is a comparatively minor one, and it is more fitting for me to accept the verdict of the experts I have mentioned, than to indulge in my own guesses, unless impelled by very strong evidence. Where the experts disagree I shall have to choose, as best I can, the dates that seem to me to be upheld by the best authorities. The above observations naturally bring me to the question of how far these traditional accounts can be trusted for a true picture of the lives of those saints. I cannot agree with a certain school that divides the traditional accounts into two categories, the possible and the impossible. The possible, that is, stories that conform to our ordinary life and the ordinary laws of nature, are called history, while the impossible that is, the miraculous element, are called myths. I do not agree to this division, for, on the one hand, good story tellers can embellish their stories with additions, or a faulty memory can do the same, and these may be quite in harmony with our ordinary human life. The fact that they are classed as possible events cannot make them history. This thesis can be easily proved. For example, Mahipati’s account of Eknãth m his. Bhaktavijaya, vvritten in 1762, differs in several important details from the fuller account of Eknãth in the Bhaktali— lariat, written in 1774, twelve years later. Some of these details are contradictory. They are in the class of the possible, but that fact cannot be trusted for accuracy. Stories passed down from mouth to mouth through can— tunes can vary as much in the probable as in the import— able events that they record. That which is called mythical because miraculous, because not conforming to the ordinary laws of nature, some would put aside as not historical This I regard as a great mistake, for the reason—and the proof of it can be given—that the mythical form given to a story may be only the embellishment of a later period.. The kernel of it can be in the class of the possible, and hence can be history. Hence, since we have no eye witnesses, and since there is no way of corroborating these stories, the question of their exact historic value may well be set aside, except in those cases where there are corroborating evidence’s from eye witnesses. These, however, are unfortunately very few. What then is the value of these stories, if we cannot be sure what details are true, and what the embellishment and additions made by story tellers up till the time wheel they were recorded by Mahipati and others many years? After those saints lived? There is much value in them, and fortunately that value does not depend on the historic basis of those stories. A moral truth can be as impressive, whether seen illustrated in the record of an event that actually took place, and that can be proved by the strongest evidence to be history, or whether seen illustrated in stories -whose historic basis is uncertain, because of the distance of time, and the accidental non-existence of corroborating eye witnesses. A moral truth stands on its own feet, and is not dependent for its value on the accidental history in which it appears, be it in a historic writing or in fable. These stories of the Marãthã saints have great moral value in that they give us pictures of God fearing, righteous men, who in their lives sought to honour God, and to live for the good of their fellowmen. Aside from these stories, there are their own poetic works, which not only mirror their own inner thoughts, but corroborate the stories of their lives by their teachings. So that it has seemed to me .a task well worth while, to make these Poet-saints of Mahãrãshtra better known to India, to the world, and even perhaps to the Marãthã people themselves, through an English translation of original sources, with comments that - a study of them for many years has made possible for me. I am well aware that these translations will have readers who will regard them from different points of view. Because these stories of the saints are so largely religious, those to whom religion is a vital matter, will naturally look at them, and weigh them, from their special standpoint. But I think there is one point of view from which we can see them alike. We can see those saints, where at Aladdin Paihan, Dehü, Paharpur, or Parali, with physical surroundings very much as they are to-day. We can see them brought up from childhood by parents or gurus in perfect faith in the religious and philosophic beliefs current in Mahãrãshtra in their day. They were loyal to those beliefs. They believed in the divine origin of the Vedas, the Upanishads, the Mahabhãrata, the Rãmãyana, and the Purãps. The Puranic stories were not myths to them, but sober history. The Vedanta .philosophy was the backbone of their thinking, like the spine of their bodily frame. Their reasoning, and the general conduct of their lives, were in harmony with their beliefs. They were not critics of those beliefs, but their interpreters. The reader may agree, or violently disagree, with their philosophic and religious beliefs, but when it comes to the stories of their lives, as they seem to have lived them, they are seen to be godly men, revering and honoring God according to their conception of Him. In their relation to men, and in the struggles with their own inner life, they may not appear to all as perfect examples, but they were examples, nevertheless, of those who loved the good, the pure, the kind, and the true. The reader may not approve of all they may have said or done, but he will be a blind reader if he cannot look behind those words and deeds and see hearts that wished to say and do what was right, and good. And when the reader, whatever his religious or philosophic beliefs may be, compares his own private life with those of these Marãthã saints, he will find in them many a helpful thought, and inspiration to a nobler life. It has been the custom of some to use these stories and the teaching of these Marãtha saints in the way of comparison with the life and teaching of other saints and teachers. Such comparison is perfectly legitimate in its place. Truth, which is what we should all seek for, is often arrived at through the path of comparison. I can, therefore, foresee that the readers of these stories will use them in different ways, and one will be that of comparison. But I as firmly believe that the scholar in his study of these saints in his comments on their lives and teaching, in his translations of the old records, should not let his personal philosophic and religious beliefs appear. The reader has a right to presuppose that the present writer has presented his subject in as impartial a way as may be possible for him. The later use of the material gathered, and recorded, is quite another thing. There personal opinions and points of view have a legitimate place. This I believe is the only right and true way for a scholar, and it is the reader’s right to demand this impartial dealing with these historic subjects. In accordance with the above I have sought to be as accurate as I could in my translations,. As exact as the materials in my possession have allowed me, and as impartial as possible in my comments on the lives of these Marãthä saints. It sometimçs falls to the lot of a translator to hesitate about some story or some expression because to his reader it might seem indelicate. But no such difficulty has yet met my path. Mahipati, and indeed all the other writers on the Marathã saints, have stories only that are pure, and I have therefore had to use no expression that would bring a blush to the most sensitive cheek. The lives of those saints were pure lives, and whatever liberties tradition may have taken in embellishing or adding to their tales, the impure has found no place. It is but fair to the reader to confess to the difficulties under which I labor in producing these translations and comments. I am in America, with no pandit at my side to help me over difficult points of text, of meaning or of idiom. My knowledge of Marãthi, is, I feel, painfully deficient, in spite of the fact that it began when I was four years of age, and that its study covers practically all my life, with perhaps special opportunities through a long life among the Marãtha people. The serious task of making these translations has made the above fact evident to my self. It will be still more evident to those Marãthi scholars whose language it is, and whose knowledge of the subject is so much more perfect than mine. But I feel as Mahipati felt. He felt himself inadequate to the task of properly presenting the lives of these saints, yet he was sure of the sympathy of his audience, through their sharing with him the love of these saints. I also have learned to love these poet-saints of Mahãrashtra, and in making this offering of English translations_flowers, may I call them—to the people of Maharashtra, I know them too well not to know that they will accept these flowers with the kindness, the courtesy, the sympathy, and the love which is so characteristic of them, not only because they are offered, but because of their own love for their old poet-saints. How many numbers will appear in this series I cannot say. That depends on the life which may be still mine. I am seventy-two years of age. Body and mind are in good health, but the limit of life is approaching. I would like to live ten years more, provided body and mind keep their health. That length of time would enable me to cover a large ground, and make the result of my many years of study available to those who may not have had the time to make independent research. But, however many or few may be the remaining years of my life, I offer them to Maharãshtra, where most of my life has been spent, and whose saints of old, and whose people to-day, I love. I begin the series with Bhãnudãs, the great grandfather of the great and noble saint, Eknãth. It will probably be followed by the Life of Eknãth. I am not planning any particular order in which I shall present these saints. That will depend on the material I have in hand, and the pro-philosophic and religious beliefs appear. The reader has a right to presuppose that the present writer has presented his subject in as impartial a way as may be possible for him. The later use of the material gathered, and recorded, is quite another thing. There personal opinions and points of view have a legitimate place. This I believe is the only right and true way for a scholar, and it is the reader’s right to demand this impartial dealing with these historic subjects. In accordance with the above I have sought to be as accurate as I could in my translations as exact as the materials in my possession have allowed me, and as impartial as possible in my comments on the lives of these Maratha saints. It sometimes falls to the lot of a translator to hesitate about some story or some expression because to his reader it might seem indelicate. But no such difficulty has yet met my path. Mahipati, and indeed all the other writers on the Maratha saints, have stories only that are pure, and I have therefore had to use no expression that would bring a blush to the most sensitive cheek. The lives of those saints were pure lives, and whatever liberties tradition may have taken in embellishing or adding to their tales, the impure has found no place. It is but fair to the reader to confess to the difficulties under which I labour in producing these translations and comments. I am in America, with no pandit at my side to help me over difficult points of text, of meaning or of idiom. My knowledge of Maritime, is, I feel, painfully deficient, in spite of the fact that it began when I was four years of age, and that its study covers practically all my life, with perhaps special opportunities through a long life among the Maratha people. The serious task of making these translations has made the above fact evident to myself. It will be still more evident to those Marathi scholars whose language it is, and whose knowledge of the subject is so much more perfect than mines But I feel as Mahipati felt. He felt himself inadequate to the task of properly presenting the lives of these saints, yet he was sure of the sympathy of his audience, through their sharing with him the love of these saints. I also have learned to love these poet-saints of Maharashtra, and in making this offering of English translations__flowers, may I call them—to the people of Maharashtra, I know them too well not to know that they will accept these flowers with the kindness, the courtesy, the sympathy, and the love which is so characteristic of them, not only because they are offered, but because of their own love for their old poet-saints. How many numbers will appear in this series I cannot say. That depends on the life which may be still mine. I am seventy-two years of age. Body and mind are in good health, but the limit of life is approaching. I would like to live ten years more, provided body and mind keep their health. That length of time would enable me to cover a large ground, and make the result of my many years of study available to those who may not have had the time to make independent research. But, however many or few may be the remaining years of my life, I offer them to Mahãrãshtra, where most of my life has been spent, and whose saints of old, and whose people to-day, I love. I begin the series with Banda’s, the great grandfather of the great and noble saint, Eknath. It will probably be followed by the Life of Eknath. I am not planning any particular order in which I shall present these saints. That will depend on the material I have in hand, and the progress of my study. 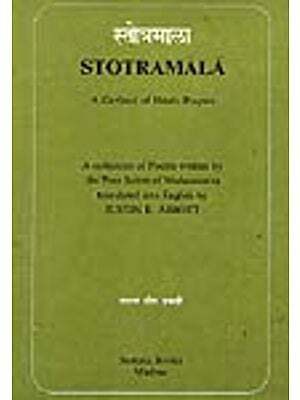 Where the lives are short I ant planning to print with the translations the original Marathi text. Where, as in the case of Eknath’s life, the account is long, the addition of the Marahi text would not be practicable. On account of the distance from India, the difficulties connected with the publishing of these translations would have seemed insurmountable, had not Dr. Nicol Macnicol of Poona, who needs no introduction to the Maratha people, offered to see them through the press. I owe him a great debt of gratitude for this kindness. It is but fitting that I should here acknowledge my debt of gratitude to Mr. V. L. Bhave, author or Maharashtra Sarasvata, to Mr. L. R. Pangarkar, to Mr. S. S. Deva, Mr. V. K. Rajvade, Mr. D. V. Potdar, and many others, who have done such valiant service in MarathI literature, and to whom I owe so much. To them I make my namaskar. Original Sources of In formation. The Maratha poets who have made Bhänudas the subject of their song are Vitihalkavi of Bid, about A.D. 1679, who relates the story of how Bhãnudas brought back the image of Vithoba from Vidyanagara. Kettav swami, about 1682, who relates the story of how the image of Vithoba was taken by Ramrãjat Vidyanagara, and how Bhanudas brought it back. Mahipati in his Bhaktavijaya, which he completed in 1762, who relates the story of the birth of Bhanudas, his childhood, his unwilling but successful mercantile life, his becoming a sannyasi, the events that led to Rãmrãja’s taking away the image of Vithoba to Vidyanagara, and its return through Bhänudas. Mahipati in his Bhaktalilamrita, which he completed in 1774, relates the story of Ramraja’s removal of the image of Vithoba to Vidyanagara, and its return through Bhanudas. This he draws largely from the account of Kegavswãmj mentioned above. 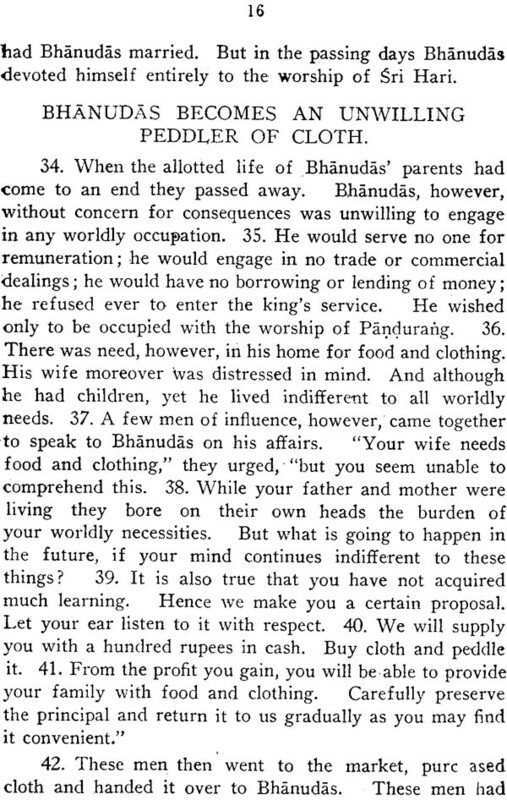 Bhimas.wanji sirgavkara, in 1797, who covers the same ground as the Bhaktavijaya account, except that he begins with the mercantile life of Bhanudas. Eknath, 1548 to 1609, the great grandson of Bhãnudas. In his Bhagavata, chap. 1, 130-132, and in his other works, he makes short references to his distinguished ancestor, corroborating some of the traditional stories recorded in the Bhaktavijaya. (See Eknãthãchi Abhapgachi GãthL Indu Prakasha Edition of 1906, p. 70 A 2, 9-12; p. 102 A 36,48;p. 106A79, 4.;p. 121 A 51,9; p. 198 A20, 3;p. 199 A. 28, 3; p 470 line 27). (See also Swãtmasukha by Eknath, line 506). (See also Sukashtaka by Eknãth, ne 438). Other Marãhã poets mention Bhãnudãs in an honour d way, but give no information regarding him. Moropant in his Sanmaiimala; Nilobã (see Nilobãchi Gãthã 1557, 148); Nãmdevachi Gãthä, abhaiigs 361 ad 775. See also Dasodigambarkrita Santa’. aya, prasaig 7; Santamãlika by Uddhavachidghana, 44; Santamalika by Jayaramasuta (Maharashtra Kavi No. 9, p. 8); Santamãlikã by ivarãm (Mahã. Kavi No. 9, p. 9); Santanamvali by Rangnath (M.K. 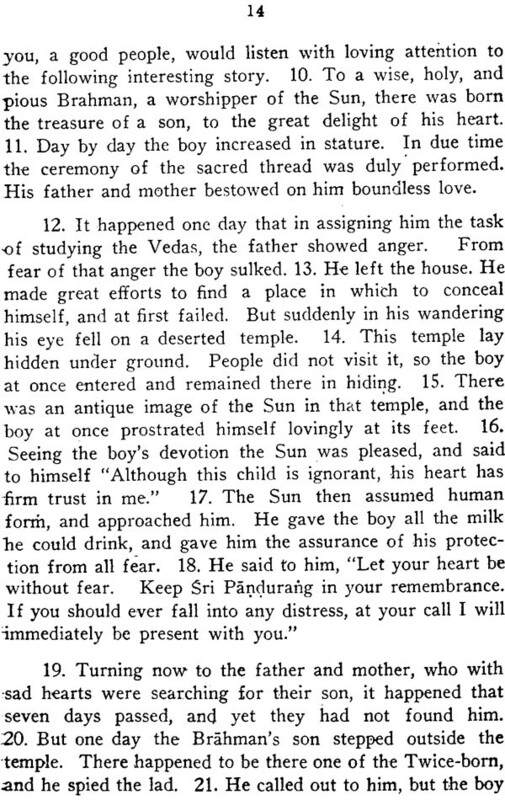 9, p. 11); Santamalika by Siddhachaitanya (M.K. 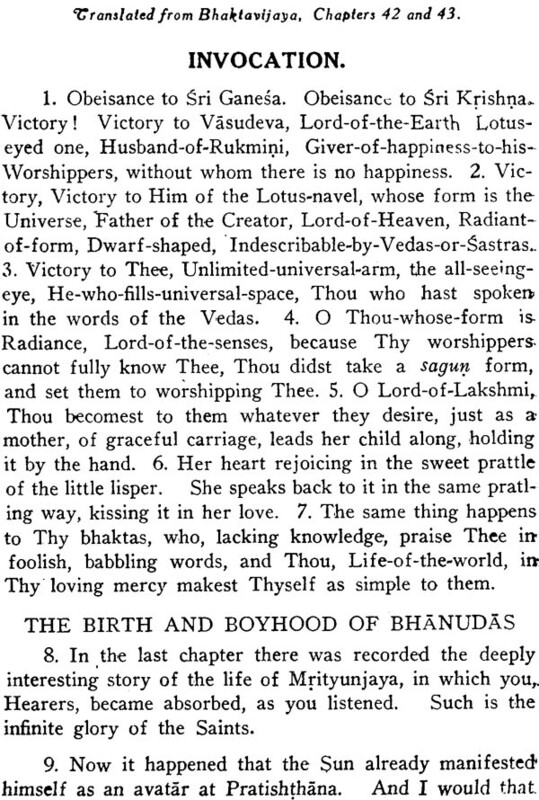 9, p. 13); Santanamavali by Bahinãbãi (Bh. I.S.M. 17, p. 77); Ganegita by Bhagavan Karhadkar (Bh. I.S.M. 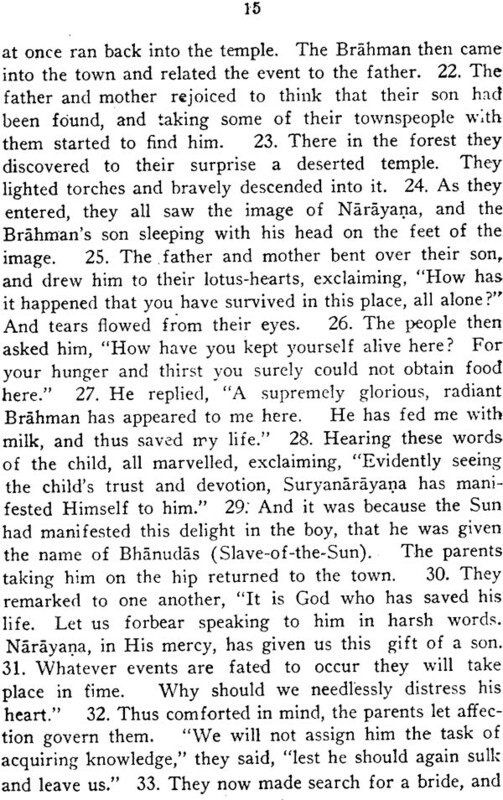 9, p. 157); Rãmavarada by Mukund (Sañkirialekh Sañgraha,. p. 19); Santamalika by Eknãth (Sañkirialekha Sañgraha). The Interrelation between the above Original Sources. A like assertion is also made in his Bhaktalilãmr 1.167-170, and one cannot question the honesty of Mayhap in his use of what he considered authorities. Compare also Bhakta1ilãirita 10.169-174, where his faithful following of written documents is again asserted, •his slight additional embellishments being compared to the good housewife who adds a little water to the fresh milk that it may suffice for her whole family. The works of Nãbhãji and Uddhavchidghana may have been an inspiration to Mahipati to commence his Bhaktavijaya, but their works, as we know them to-day, are too meager to have been of any value to him in his detailed account of the many saints of whom he wrote. His information therefore must have come from the many other books which were extant in his day. It would not be safe to say that Mahapati did not draw from oral tradition in some cases, but that that was not his ordinary method is clear from his own definite statements, and from the results of a critical examination of his works. Turning now to his account of Bhan, idas, and that of Vitthal Kavi and Keiavswami, it is clear that all three originate in a common source, in the form of a written document. That original source is, either, now not extant, or is yet to be found, in some private collection of manuscripts. It was probably written, somewhere midway between the death of Eknãth (1609), and the poet Vitthal Kavi, who made use of it. The above statement is of course an hypothesis, but one that, if true, clears away difficulties connected with the relation of the different original sources to on2 other. With this hypothesis, the relation of the several accounts, may be graphically represented. The unknown Bhãnudãs-charitra, suggested above in my hypothesis, was probably a part of an Eknãthcharitra, that also being now unknown. Mahipati used it in his Bhakatavijaya account of Eknãth, as Keavswãmi had also done before him. But Mahipati in his Bhaktalilamrita, seems to have regarded Keavswami a better authority, so that in his Bhaktalilãmrita account of Eknãth, Mahipati draws his information from that source. This hypothesis provides a needed key for the explanation of the differences in important details between the account of Eknãth in the Bhaktavijaya and that in the Bhaktalilãmrita. When Keavswãmi’s text and that of the Bhaktaljlãmrjta are placed side by side the reader can have no doubt as to Mahipati’s source for his Bhaktalilamrita account of Eknãth. It is to be hoped that, this now unknown source from which Mahipati drew his Bhaktavijaya account, may yet be discovered. Could the author be Muktewar, grandson of Eknãth, who’ sri Khatdyakhyana, may have been a part ‘f a now non extant Eknãthcharjtra?